"There's no getting away from it, I've eaten some pretty extreme things in my time - live tarantulas, raw goat testicles, elephant dung, you name it. In a situation when your life depends on it, you need to put your prejudices aside to keep your stomach filled and your strength up. Whether it's mastering the art of foraging and cooking up a tasty feast around the campfire or learning about the more extreme end of Wild food (ever tried a scorpion kebab?) , there's a lot to learn when it comes to dinner time in the wild. This book will teach you all the necessary sk IIS and techniques to get your teeth into meals you might never have thought of as food in the first place - and, crucially, how to recognize plants and animals that might end up doing you more harm than good. In today's world, we rarely need to venture beyond the local supermarket and we turn our noses up at the thought of snacking on bugs and grubs. aut out in the wild, Mother Nature has provided us With a plentiful supply of nutritious - if not always delicious - food for the taking. And when needs must, we just have to know where to look. Some of it might take you out of your comfort zone. Some of it might turn your stomach. But it's saved my life more than once. And one day, it might save yours . 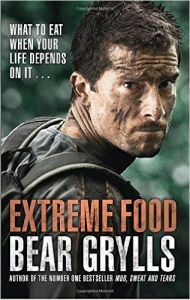 Bear Grylls' prime-time TV adventure series are some of the most watched shows on the planet, reaching an estimated 1.2 billion viewers in over 200 countries. Bear has authored twelve books, including the international bestse er Mud, Sweat and Tears, which has been translated Into thirteen languages and was voted the most Influential book in China in 2012. He originally served as a Trooper with 21 SAS, as part of the UK Reserve Special Forces and subsequently led many record-breaking expeditions to the world's extremes, raising ml ons of pounds for children's charities. In recognition of this Sear was made an honorary Lieutenant Commander in the Royal Navy as well as a Colonel in the elite Royal Marines Commandos. In 2009, Bear took over as the youngest ever Chief Scout to the Scouting Association, acting as a figurehead to 30 million Scouts around the globe. He lives with his wife, Shara and their three sons, Jesse, Marmaduke and Huckleberry, on a Dutch barge in London and on a small remote island off the coast of Wales.